ADJOURN – A motion to adjourn ends that day’s session. ADJOURN FOR MORE THAN 3 DAYS – Under the Constitution, neither chamber may adjourn for more than three days without the approval of the other. Such approval is obtained in a concurrent resolution approved by both chambers. AMENDMENT – A proposal to alter the text of a pending bill or other measure by striking out some of it, by inserting new language, or both. AMENDMENT IN THE NATURE OF A SUBTITUTE – An amendment that would strike out the entire text of a bill or other measure and insert a different full text. APPROPRIATION – The provision of funds, through an annual appropriations act or a permanent law, for federal agencies to make payments out of the Treasury for specified purposes. BILL – The principal vehicle employed by lawmakers for introducing their proposals. Bills are designated with an S (for the Senate) or H.R. (for the House of Representatives) and a number depending on the order in which they are introduced in the respective chamber. They address either matters of general interest (“public bills”) or narrow interest (“private bills”), such as immigration cases and individual claims against the Federal government. CAUCUS – An informal organization of Members of the House, the Senate, or both, that exists to discuss issues of mutual concern and possibly to perform legislative research and policy planning for its members. There are regional, political or ideological, ethnic, and economic-based caucuses. 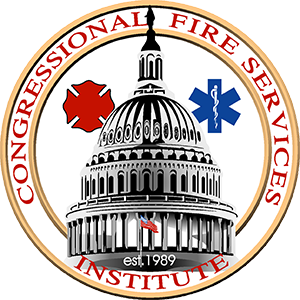 The Congressional Fire Services Caucus is the largest caucus in Congress. CHAIRMAN –The presiding officer of a committee or subcommittee. CHAPLAIN – Each chamber has a clergyman tasked with open the daily sessions with prayer. The chaplain is also available as an advisor and counselor to members, their families, and congressional employees. CLASS – Article I, section 3 of the Constitution requires the Senate to be divided into three classes for purposes of elections. Senators are elected to six-year terms, and every two years the members of one class—approximately one-third of the Senators—face election or reelection. CLEAN BILL – Generally, after a committee has amended legislation, the chairman may be authorized by the panel to assemble the changes and what remains unchanged from the original bill and then reintroduce everything as a clean bill. CLOAKROOM – Democratic and Republican cloakrooms adjacent to the chambers serve as gathering places for party members to discuss chamber business privately. COMMITTEE – Subsidiary organization of the House and Senate established for the purpose of considering legislation, conducting hearings and investigations, or carrying out other assignments as instructed by the parent chamber. CONCURRENT RESOLUTION – A legislative measure generally employed to address the sentiments of both chambers, to deal with issues or matters affecting both houses, such as a concurrent budget resolution, or to create a temporary joint committee. Concurrent resolutions are not submitted to the President and thus do not have the force of law. CONFEREES – Members appointed to serve on conference committees. They are also called “managers.” Conferees are usually appointed from the committee or committees that reported the legislation; they are expected to try and uphold their chamber’s position on measures when they negotiate with conferees from the other body. CONFERENCE REPORT – The compromise product negotiated by the conference committee. The “conference report” is submitted to each chamber for its consideration, such as approval or disapproval. CONGRESSIONAL RECORD – The substantially verbatim account of daily proceedings in each chamber. It is printed for each day either the House or Senate is in session. At the back of each daily issue is the “Daily Digest,” which summarizes the day’s floor and committee activities. CONSIDERATION – To “call up” or “lay down” a bill or other measure is to place it before the chamber for consideration, including debate, amendment, and voting. DISCRETIONARY SPENDING – Spending (budget authority and outlays) controlled in annual appropriations acts. ENGROSSED BILL – The official copy of a bill or joint resolution passed by either the House or Senate. EX OFFICIO – Literally, by virtue of one’s office. The term refers to the practice that allows the chairman and ranking minority member of a committee to participate in any of the subcommittees of that committee, but generally not to vote. EXECUTIVE CALENDAR – A list of executive business (i.e., treaties and nominations) available for Senate floor consideration. FISCAL YEAR – The fiscal year is the accounting period for the federal government which begins on October 1 and ends on September 30. The fiscal year is designated by the calendar year in which it ends. Congress passes appropriations legislation to fund the government for every fiscal year. FLOOR AMENDMENT – An amendment offered from the floor during consideration of a bill or other measure, in contrast to a committee amendment. FLOOR MANAGER– Members designated to lead and organize consideration of a bill or other measure on the floor. They usually are the chairman and ranking minority member of the reporting committee or their designees. HEARING – A meeting of a committee or subcommittee — generally open to the public — to take testimony in order to gather information and opinions on proposed legislation, to conduct an investigation, or review the operation or other aspects of a Federal agency or program. JOINT MEETING – An occasion, often ceremonial, when the House and Senate meet together to hear an address by various dignitaries, such as foreign leaders. JOINT RESOLUTION – A legislative measure which requires the approval of both chambers and, with one exception, is submitted (just as a bill) to the President for possible signature into law. The one exception is that joint resolutions (and not bills) are used to propose constitutional amendments. These resolutions require a two-thirds affirmative vote in each house but are not submitted to the President; they become effective when ratified by three-quarters of the States. JOINT SESSION – When the House and Senate meet together to conduct formal business or to hear an address by the President of the United States. JOURNAL – Under the Constitution, the House and Senate are required to keep a Journal of their official proceedings, such as motions agreed to and votes taken. "LAME DUCK" SESSION – When either chamber of Congress reconvenes in an even-numbered year following the November general elections to consider various items of business. Some lawmakers who return for this session will not be in the next Congress. Hence, they are informally called “lame duck” Members participating in a “lame duck” session. LEGISLATIVE DAY – A “day” that starts when the chamber meets after an adjournment and ends when the chamber next adjourns. Hence, a legislative day may extend over several calendar days or even weeks and months. LEGISLATIVE SESSION – That part of the chamber’s daily session in which it considers legislative business (bills, resolutions, and actions related thereto). LINE-ITEM VETO – Authority to veto part rather than all of an appropriations act. The President does not now have item-veto authority. He must sign or veto the entire appropriations act. MEASURE – Term embracing bill, resolution and other matters on which Congress takes action. morning business – Routine business that is supposed to occur during the first two hours of a new legislative day. This business includes receiving messages from the President, reports from executive branch officials, petitions from citizens, memorials from States, and committee reports, and the introduction of bills and submission of resolutions. MOTION TO PROCEED TO CONSIDER – A motion to bring a bill or other measure up for consideration. The usual way of bringing a measure to the floor when unanimous consent to do so cannot be obtained. For legislative business, the motion is debatable under most circumstances. NOMINATION – An appointment by the President to executive or judicial office that is subject to Senate confirmation. NONGERMANE AMENDMENT – An amendment that would add new and different subject matter to, or may be irrelevant to, the bill or other measure it seeks to amend. OBLIGATION– An order placed, contract awarded, service received, or similar transaction during a given period that will require payments during the same or a future period. PARLIAMENTARIAN – The Parliamentarian a chamber’s advisor on the interpretation of its rules and procedures. PARLIAMENTARY INQUIRY – A question from the floor to the Presiding Officer requesting a clarification of the procedural situation on the floor. PRESIDENT OF THE SENATE – Under the Constitution, the Vice President serves as President of the Senate. He may vote in the Senate in the case of a tie, but is not required to. The President Pro Tempore (and others designated by him) usually perform these duties during the Vice President’s frequent absences from the Senate. PROSIDENT PRO TEMPORE – A constitutionally recognized officer of the Senate who presides over the chamber in the absence of the Vice President. The President Pro Tempore (or, “president for a time”) is elected by the Senate and is, by custom, the Senator of the majority party with the longest record of continuous service. PRO FORMA SESSION – A brief meeting (sometimes only several seconds) in which no business is conducted. It is held usually to satisfy the constitutional obligation that neither chamber can adjourn for more than three days without the consent of the other. PROXY VOTING – The practice of allowing a member to cast a vote in committee for an absent member. QUORUM – The Constitution requires a majority of members for a quorum. Often, fewer members are actually present on the floor, but the body presumes that a quorum is present unless the contrary is shown by a roll call vote or quorum call. QUORUM CALL – A call of the roll to establish whether a quorum is present. Often, a quorum call is terminated by unanimous consent before completion, and is used to obtain a brief delay to work out some difficulty or await a member’s arrival. RANKING MINORITY MEMBER – The highest ranking minority member of a committee or subcommittee. RECESS – A temporary interruption of business. Generally, each chamber recesses (rather than adjourns) at the end of each calendar day. RECONCILIATION INSTRUCTION– A provision in a budget resolution directing one or more committees to report (or submit to the Budget Committee) legislation changing existing law in order to bring spending, revenues, or the debt-limit into conformity with the budget resolution. The instructions specify the committees to which they apply, indicate the appropriate dollar changes to be achieved, and usually provide a deadline by which the legislation is to be reported or submitted. RECONCILIATION PROCESS– A process established in the Congressional Budget Act of 1974 by which Congress changes existing laws to conform tax and spending levels to the levels set in a budget resolution. Changes recommended by committees pursuant to a reconciliation instruction are incorporated into a reconciliation measure. REFERRAL – After a bill or resolution is introduced it is normally referred to the committee having jurisdiction over the subject of the bill. REPORT – Committees usually publish a committee report to accompany the legislation they have voted out. Committee reports discuss and explain the purpose of measures and contain other, related information. The term may also refer to the action taken by a committee (“report the legislation”) to submit its recommendations. ROLL CALL VOTE – A vote in which each member votes “yea” or “nay” as his or her name is called by the Clerk, so that the names on each side are recorded. SECRETARY OF STATE – The chief legislative officer nominated by the majority party conference and elected by the Senate. The Secretary affirms the accuracy of bill text by signing all measures that pass the Senate. The Secretary supervises the preparation and printing of bills and reports, the publication of the Congressional Record and Senate journals, and other matters. SELECT OR SPECIAL COMMITTEE – A committee established for a limited time period to perform a particular study or investigation. SERGEANT AT ARMS – The chief security officer of each chamber, the Sergeant at Arms and staff in the office help to preserve order in the chamber and galleries. SIMPLE RESOLUTION – Simple resolutions are used to express nonbinding positions or to deal with the internal affairs. They do not require action by the other chamber. STANDING COMMITTEE – Permanent committees specializing in the consideration of particular subject areas. UNANIMOUS CONSENT – A request for unanimous consent on the floor to set aside a specified rule of procedure so as to expedite proceedings. UNANIMOUS CONSENT AGREEMENT – A unanimous consent request setting terms for the consideration of a specified bill or other measure. VOICE VOTE – A vote in which the Presiding Officer states the question, then asks those in favor and against to say “Yea” or “Nay,” respectively, and announces the result according to his or her judgment. VOTE – Unless rules specify otherwise, each chamber may agree to any question by a majority of members voting, if a quorum is present. The Chair puts each question by voice vote unless the “yeas and nays” are requested, in which case a roll call vote occurs. YEAS AND NAYS – A member who wants a roll call vote on a pending question asks for the “yeas and nays” on the question. YIELD – When a member who has been recognized to speak “yields” to another, he or she permits the other to speak while the first member retains the floor. YIELD THE FLOOR – A member who has been recognized to speak yields the floor when he or she completes his or her remarks and terminates his or her recognition.